Isn't YouTube great? So much content, so much fun, and it never, ever ends! But who has time to sit around all day searching for and streaming video content? Wouldn't it be amazing if there were an application that could download YouTube content straight to your hard drive for you to watch anytime, at your leisure? Well, there is! YouTubeGet is an all-in-one software that can quickly and easily download (and convert) YouTube content straight to you your hard drive. The YouTubeGet float bar sits on your desktop -- all you need to do is drag the video onto it, select the appropriate options and setting, and wait for the video to be quickly deposited onto your hard disk. There's more! YouTubeGet lets you convert videos for use on Pocket PCs, PSPs, iPods, and mobile phones. Small, elegant, and easy-to-use, YouTubeGet is all you need for obtaining and converting YouTube content. 1- Find your videos: Visit YouTube.com, select your favorite videos, drag their URLs onto the YouTubeGet Drag Zone. 3- Download and Convert: Click the Download Button and fix yourself a cup of coffee. When the downloading is finished, an alert will sound and YouTubeGet will open an explorer window to show you where the converted files are located. Download Youtube Videos to Mobile Phones: Auto-convert YouTube Videos to the 3GP Mobile Phone Format. Download Youtube Videos to iPods and PSPs: Download YouTube videos and save them in iPod MOV or MP4 formats. Clipboard Monitor: YouTubeGet monitors the Windows clipboard at all times. Any time you copy a YouTube video URL, the Add New Download window will automatically pop up. FLV Converter: Convert local FLV files to AVI, WMV, MOV, 3GP, MP4 etc. Youtube Browser: Search YouTube videos and preview them before downloading. If you want to download them, simply click the Download Now button. 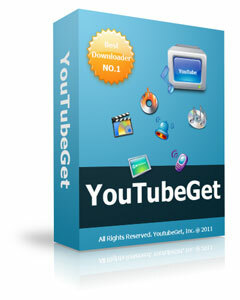 Description: YouTubeGet is an all-in-one software designed to make quick and easy work to download YouTube videos and convert them. Offering a multitude of methods to acquire the video, this application has all the power you need while still remaining small and easy to use. After downloading videos it will auto convert FLV files to MP4, 3GP, AVI, WMV, MOV etc. Soon, you can see YouTube videos on your MP4 or Cell phone.